The guided missile destroyer USS Jason Dunham seized an illicit weapons shipment containing 2 521 AK-47 rifles on 28 August in the Gulf of Aden. The weapons were found aboard a stateless skiff in international waters in the Gulf of Aden. The full count follows an initial estimate of more than 1,000 rifles. The skiff was determined to be stateless following a flag-verification boarding conducted in accordance with international law. The origin and intended destination of the skiff have not yet been determined. “As a part of our countertrafficking mission, we are actively involved in searching for illegal weapons shipments of all kinds,” said Navy Vice Adm. Scott Stearney, commander of U.S. Naval Forces Central Command, U.S. 5th Fleet, and the Combined Maritime Forces. “Ensuring the free flow of commerce for legitimate traffic and countering malign actors at sea continue to be paramount to the U.S. Navy and its regional partners and allies,” Stearney added. The seizure comes after four weapons seizures in 2015 and 2016 accomplished by Combined Maritime Forces and U.S. 5th Fleet assets. The first seizure was by the Royal Australian Navy’s HMAS Melbourne, Sept. 27, 2015, when it intercepted a dhow containing 75 anti-tank guided munitions, four tripods with associated equipment, four launch tubes, two launcher assembly units and three missile guidance sets. 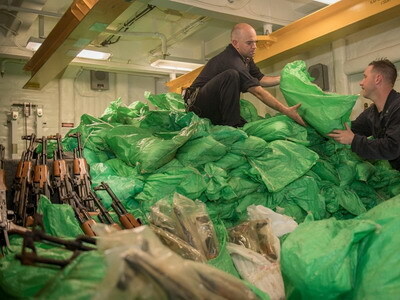 The second seizure was by the Royal Australian Navy’s HMAS Darwin, which intercepted a dhow Feb. 27, 2016, and confiscated nearly 2,000 AK-47 rifles, 81 rocket-propelled grenade launchers, 49 PKM general purpose machine guns, 39 spare PKM barrels and 20 60 mm mortar tubes. The third seizure was by the French navy destroyer FS Provence March 20, 2016, and yielded again almost 2,000 AK-47 rifles, 64 Dragunov sniper rifles, nine anti-tank missiles and six PK machine guns with bipods. The fourth seizure was by U.S. Navy coastal patrol ship USS Sirocco, which was operating as part of U.S. 5th Fleet, March 28, 2016, when it intercepted a dhow containing 1,500 AK-47s, 200 RPG launchers and 21 .50-caliber machine guns. The United Kingdom-based investigative organization Conflict Armament Research studied and linked three of the caches to weapons that plausibly derive from Iranian stockpiles. Based on an analysis of all available information, including crew interviews, a review of onboard records and an examination of the arms aboard the vessel, the United States concluded that the arms from the four interdictions in 2015 and 2016 originated in Iran and were intended to be delivered to the Houthis in Yemen in contravention of United Nations Security Council Resolution 2216. ISS: Sharp drop in African piracy: are we missing something?